Nice AVR, tons of real power. Huh. I didn't know Sunfire had receivers. Sweet! Yes, South Bend Indiana area. Price lowered again. Yes located in South Bend Indiana 46628. This is 200x7 watts. That great sunfire sound in a gorgously kept package. Huge price drop! Who wants some sunfire / carver in their life? Does this unit have multi-in's? Might put it on surround duty if it's still here in a couple weeks, since I'm burnt out on this UPA-500. Great deal. I have the separates in the stated power. For those who live in places with hot summers, these things run cool! Does this unit have multi-in's? Yes it does. 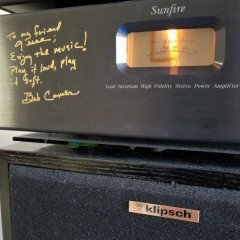 From what i read this thing does not quite have the sound of the separate sunfire amp and preamp but is very close Also costs wayy less than if you were to buy the separate sunfire amp and processor. Really solid receiver and i love the lights on it. It is in great condition. The buyer will not be disappointed. These are great budget units with lots of power and useful features, a few of my friends and family run these and I have one I'll probably never get rid of. Good luck with your sale!